Yup. You heard it right. Vegetarian Moussaka for Meatless Mondays. I know what you are thinking: how dare she mess with that wonderful Greek casserole made with ground lamb and eggplant. This dish really has nothing to do with Greece, except for the eggplant in the recipe, and the lentils look like the ground lamb. I was inspired by Silvie from Citron & Vanille, and in my efforts to make more meatless meals during the week, I decided to give this a try. Now, I don't really expect you to make this, but if you happen to HAVE leftover roasted vegetables of any kind, and a bag of ready cooked Beluga Black Lentils from Trader Joe's in the house, then I would highly recommend you try this healthy, satisfying dish. And you won't feel guilty eating 2 pieces! 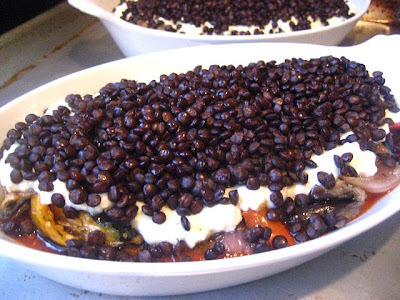 The meaty black lentils (don't use the French green lentils) substitute the meat in this dish, and I used lowfat cottage cheese instead of ricotta cheese. After all, this is not an Italian dish, and I can do what I want, it's my kitchen. This dish is all about the layering. Spoon some ready made tomato sauce at the bottom of a gratin dish. Next, lay grilled eggplant slices (I just happen to have them in the fridge), and then a layer of your roasted vegetables. I used red pepper, eggplant, zucchini and red onions. (To roast vegetables, slice or cube vegetable of your choice and sprinkle liberally w/ kosher salt and olive oil. Roast on a baking sheet at 400F for about 20 minutes until done). Mix about 2 cups of cottage cheese with 1 egg and 1/4 cup of grated parmesan, salt & pepper. Layer the cheese mixture on top of the vegetables. Next layer the cooked black Beluga lentils on top. You can tell the carnivores that this is the meat. Bake in a 375F oven for 30 minutes until cheese is melted and bubbly. This was a healthy, delicious and creative dinner. The lentils have 17 grams of fiber! and 30 grams of iron. Great for lowering cholesterol. Served with a salad, we loved this! Even the husband went for a second piece! It's beautiful and I wish we had a Trader Joe's here! Meatless is good, and this one looks hearty and colorful. I don't like eggplant, but I am not going to give up trying. This recipe just might re-train my taste buds to like it. 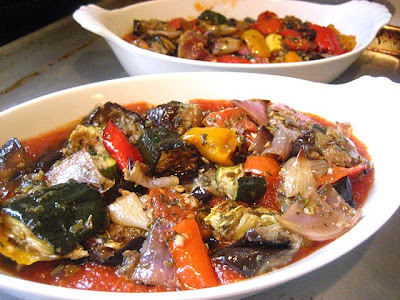 I think that looks like a fabulous veggie meal though I'd have to do something other than eggplant too. Yay Stacey! I love you making vegetarian food. I have made moussaka a handful of times (from a Bon Appetit) recipe and have gotten sick every time because it is so rich. (Bechamel sauce kills me.) This looks absolutely terrific and about 1 million times lighter. Plus, I have never met a lentil I didn't like. Thanks for this! 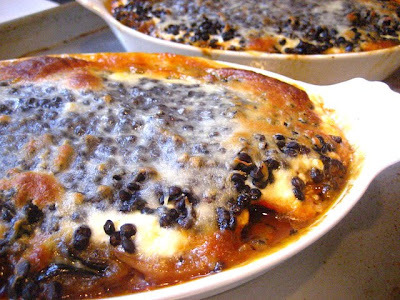 I think I can eat vegetarian moussaka if look as good as this. I would probably love this - and I probably wouldn't eat the one with lamb because I just can't put lamb past my lips without feeling not so good...Looks delish to me! who needs meat when you've got this recipe. Your moussaka looks really delicious, I like your substitutions, and yes we can do whatever we want in our kitchen! 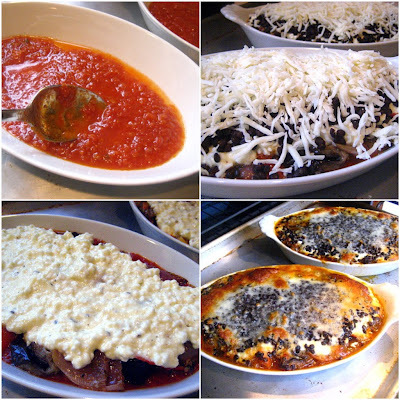 That is one healthy alternative for traditional moussaka-Love it. i love moussaka! I've always wanted to try it vegetarian style! I like your vegetarian version much better than the classic, and you an give me all the eggplant some of your commenters didn't want! You know I love eggplant. I am so interested in mock meals! I just made this and it was delicious! I left out the eggplant (not an eggplant fan) and added roasted jalapenos and carrots. Thanks for the idea! Hey now, I ate vegetarian moussaka in Greece, and saw it advertised all over Athens. Just because it doesn't have lamb doesn't mean it has nothing to do with Greece!